Thank you to Lotus J. aka ngawangchodron@Flickr for sharing today’s photograph (original image | BPotD Flickr Group Pool). Very much appreciated! Today marks seven years since I started at the garden. It’s fitting that today’s BPotD is one of my favourite plants. Caltha palustris, or marsh marigold, is a species of firsts for me. I remember it as being the first species I could certainly identify and the first species where I knew the scientific name. In other words, it represented the conceptual passage for me from “flower” and “pine tree” and “shrub” to Caltha palustris, Pinus banksiana and Viburnum rafinesquianum. I also remember marsh marigold as revealing to me the relative rarity of masses of blooms of one species (an example of what I mean) – or, to clarify, the uncommon encountering of these visual treats by (sub)urbanites like myself. 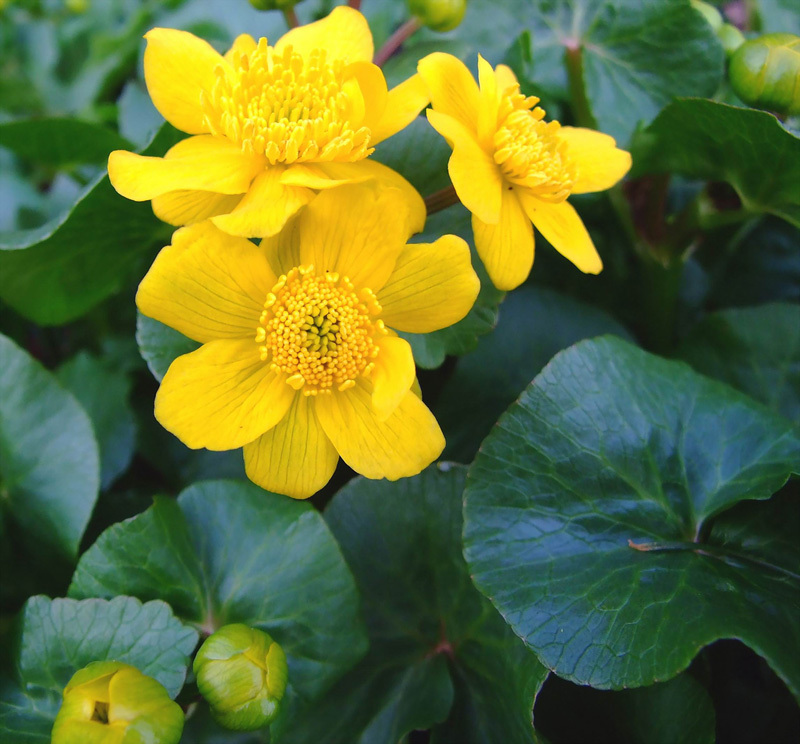 Marsh marigold is native to much of the temperate Northern Hemisphere. In many places, it is among the first to bloom in the springtime (where I grew up, it was often the third noticeable flower, after coltsfoot and prairie crocus). Palustris means “of a marsh”, indicating the typical habitat for this species. I should note that this species is poisonous – not a surprise, if you’ve been reading other entries featuring species in the Ranunculaceae. The Plants for a Future database has more on its chemical properties. A few updates on the Hydatellaceae story – three more photographs have been added, as well as a few media report links. If permission is granted, there’ll also be another piece of artwork later today. I’m still waiting for the NPR and BBC interviews to be available online, though. Sean has told me he’s also inquired with Nature re: making the paper available. Congratulations Daniel! Many thanks for your tireless work on this wonderful site, which is very much appreciated by your recipients. Caltha palustris was my first “proper” identification, too; I well remember sitting in a dusty Botany lab at school cutting the flower in half with a scalpel so it could be drawn in section…happy days! Congratualations Daniel on your anniversary at the UBC BG. Also a special ‘Thanks’ for your daily faithfulness in providing the BPotD — both photographs and comments. They are most enlightening and assist many of us in expanding our knowledge of the fascinating world of plants. And an indirect, but since ‘Thanks’ to Beverley for so quickly providing the daily hardiness information about the BPotD. Thanks! I’ve not heard anything on the radio yet (re BBC interview). Congratulations on your seven year anniversary. May you have many more, to your own benefit and ours! Sincere congratulations, Daniel, we appreciate the BPotD so much!! Thank you! Oh, Marsh Marigolds! Beautiful sight after the long winter sleep. In early spring, my hiking buddy, Heidi and I would run to Bronte Creek PP in southern Ontario to check out and photograph to our hearts content the trilliums and the Marsh Marigolds. Now, that I’m a Calgary resident, they are more difficult to find. Thanks Daniel for great photographs, for your seven years of dedication with UBC and sharing this web page with us. Some day I will make it to BC and check your gardens. Where I can get see for this plant.